SDCC Exclusive color-variant bobble head. Features the Gremlin on an airplane-wing base. Derived from a terrifying episode of The Twilight Zone. Bif Bang Pow! limited edition of only 504 pieces! 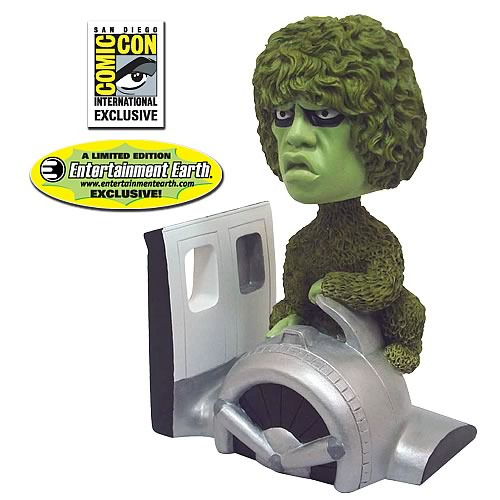 An Entertainment Earth San Diego Comic-Con International exclusive! Bif Bang Pow! presents the Gremlin from the terrifying "Nightmare at 20,000 Feet" episode of The Twilight Zone. Limited to only 504 pieces, this ultra-creepy bobble head is authentically designed and exactly painted in color. It measures 6-inches tall x 5-inches wide x 3-inches long. Inspired by one of the most memorable scenes from the show, the remarkable airplane-wing base has Gremlin sitting on the engine housing, tearing pieces from the wing! The wobbler also features the perspective from the inside of the airplane cabin with the window that faces Gremlin. You'll be having nightmares yourself if you let this get away from you! Limited edition of only 504 pieces. Note: This item is a bobble head; it is not a full-size replica of Gremlin.